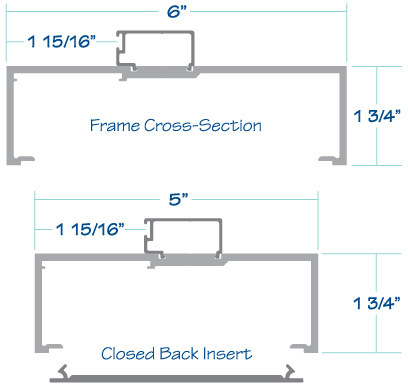 Not only does Cline offer exceptional doors, but also a heavy-duty framing system. All frames come with a 1.75-inch profile design combined with the choice of a 5-inch or 6-inch frame depth. Standard frames are manufactured with an open-back design, or an optional closed-back tubular style to meet individual job specifications. Cline's frames feature 1/8-inch thick walls to allow for surfaced mounted hardware. Cline also has the ability to provide our frames with transoms and sidelites, open for glass, fixed panels, and removable panels. All frames ship knock-down and assemble effortlessly in the field. This unique design provides a sleek appearance where all mounting hardware is concealed. Aluminum heavy-duty frames shall be Cline 5-inch (127mm) frames. Frames shall be constructed from extruded aluminum 6063-T5 alloy with a minimum wall thickness of 0.125-inch (3.18mm). Corners shall be cut square and fastened using concealed stainless steel screws. Snap-in door stop to receive replaceable wool pile weather-stripping. Hinge and strike mounting plates shall be of 0.1875-inch (4.76mm) extruded aluminum bar stock. Frame option of Cline 6-inch (152.39mm) frame to be specified. Hinge and strike plates shall be fully mortised in frame. Hinges shall be prepped for standard weight 4.5-inch x 4.5-inch (114.3mm) template hinge. Lock strikes shall be 4.875-inch (123.84mm) in accordance with ANSI Standards A115.1 or A115.2. All surface hardware shall be drilled and tapped in the field by installer. Special hardware preparation available. Frames shall be anodized in accordance with Aluminum Association Class II AAM12C22A31, Clear 0.4 mil (0.01mm) minimum thickness. Class-1 or other distinctive finishes available.